Join me as Todd Howard reveals this one crazy trick behind his success which left other game developers hating him. Fascinatingly, according to Todd, the greatest thing about Bethesda isn’t the games they make. 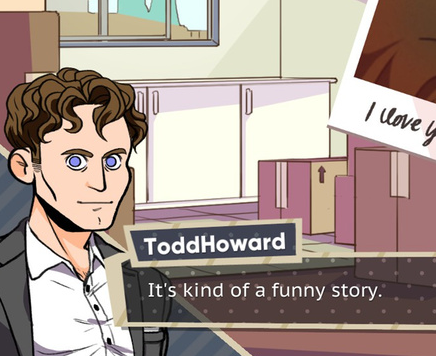 Unfortunately it also it isn’t what you think—that being Todd Howard himself. According to Todd it’s what the company does for charity and it’s not something they brag about. Bethesda Games Studios secretly contributes to the make-a-wish program. Terminally ill children can get a chance to visit the company, to see how the games are made and play them at the “working bench”. This is something Todd is proud of, but doesn’t like to talk a lot about. Because he’s just that cool of a guy. So kids, now you know what to do—if you want to meet Todd Howard himself get terminally ill now. Maybe you can meet him one day. I would do it, I still might have some radioactive barrels lying around, but unfortunately I’m no child and my family would never take me to Bethesda. Thanks mooom.